Prices and specs on a variety of AOC monitors now available or coming soon to the United States. AOC is planning to bombard the U.S. market with a bunch of new gaming monitors this year. The company detailed five new displays from its premium Agon line, two of which are supposedly available now (both say 1-2 months on Amazon) and the other three coming soon. The first two are 24-inch monitors. One of them supports Adaptive Sync (AG241QX) and the the other features G-Sync support (AG241QG). AOC's AG241QX is the cheaper of the two at $400 on Amazon. It uses a TN panel with a 2560x1440 resolution and its built for speed with a 144Hz refresh rate and 1ms response time. Other specs include a 50,000,000:1 dynamic contrast ratio and 350 nits brightness. Connectivity consists of VGA, DVI, HDMI 1.4, HDMI 2.0, and DisplayPort. There is also a 4-port USB hub, along with built-in speakers and audio in/outputs. 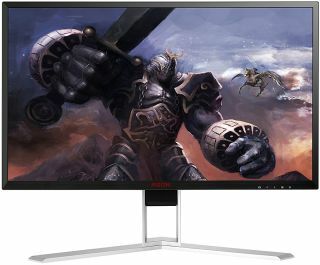 The AG241QG with G-Sync support costs $550 on Amazon and also features a TN panel with a 2560x1440 resolution, 50,000,000:1 dynamic contrast ratio, and 350 nits brightness. It has a 1ms response time as well, but a slightly higher refresh rate at 165Hz through the DisplayPort. Fewer connectivity options are available on this one—HDMI 1.4 and DisplayPort 1.2, along with a 4-port USB hub. Like its Adaptive Sync sibling, it also features audio in/outputs and built-in speakers. In AOC's press release, it lists the prices at $500 for the AG241QX and $700 for the AG241QG. Amazon has them both listed at a 20 percent discount. It is not known if those are permanent selling prices or temporary discounts. Moving on, AOC is has three other monitors on tap. One is the AG271UG, a 27-inch 4K resolution display with G-Sync support and a 4ms response time. It will arrive in late March for $800. The second is the AG352UCG, a 35-inch monitors with 2,000mm curvature radius, 3440x1440 resolution, and G-Sync support. This one will also arrive in late March, for $1,000. Finally, there is the AG251FZ. AOC is short on details here, indicating only that it will be the fastest Agon gaming monitor available with a 240Hz refresh rate. This one is slated to arrive in May for $500.